It’s no secret the stock market has had a great first quarter despite the economic slowdown. The S&P 500 is up about 20.5% since Christmas Eve as it has almost recovered all the losses from the mini-bear market late last year. The CNN fear and greed index is at 67 out of 100 which signals greed; stocks recovered swiftly from their 5 day losing streak early in March. To be clear, global equities have had a similarly great year as the MSCI all country world index is up 12.33% year to date. The shocking part of this situation is even though stocks are rallying, the Merrill Lynch fund manager survey shows there is no greed in equities. As you can see from the chart below, the net percentage of fund managers that said they were overweight equities was 3% which is the lowest level since September 2016. This skepticism is similar to the prior two slowdowns in this expansion. Fund managers are following the economy rather than chasing the momentum. This is positive for stocks because it means there are still investors who can transition into bulls, the “money on the sidelines”, which will provide more fuel for this rally. 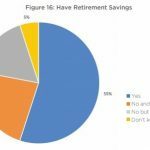 This survey is the opposite of most non-professional investor surveys on U.S. equities which show some level of exuberance and overvaluation. Remarkably in such an amazing environment for equities fund managers are overweight cash relative to historical positioning. That has been a big mistake as stocks are having a great year and a great month. The net percentage of fund managers who think the dollar is overvalued is the highest since 2002. That’s a reason to get out of cash if it’s in dollars. Fund managers have a great track record of calling changes to the dollar index. The chart below shows fund managers are highly overweight utilities, while going underweight industrials. Both S&P sectors have rallied strongly this year. The utilities are outperforming because of the decline in treasury yields. The US industrial sector has recently been hurt by the correction in Boeing stock because of its plane crash in Ethiopia. Besides that, the sector has done well despite the weakness in American industrial production growth and the decline in global manufacturing growth. Finally, fund managers are only slightly overweight U.S. stocks despite the amazing rally we mentioned earlier. If fund managers move towards being overweight U.S. stocks because they see growth accelerating again, we will likely see new records set. Speaking of wrong predictions, the top left chart shows the consensus has predicted higher 10 year yields since the early 1990s, which has usually been a mistake. 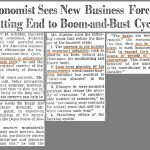 Economists only predicted lower yields in 2 of 26 years. As the bottom left chart shows, bond yields have driven sector performance as the ratio between banks and utilities’ returns has been correlated with the 10 year yield. That relationship exists even as stocks have fallen while yields have fallen. The top right chart shows gold is inversely correlated with real yields. Inflation and yields are falling, making it tough to say where real yields are going. Finally, the bottom right chart shows the difference between the 10 year yield and the 2 year yield is correlated with the ratio of value stocks to growth stocks. Once the curve starts to steepen, value stocks might begin to outperform. As you can see from the chart below, there is now $9.32 trillion in negative yielding debt outstanding. While US treasury yields have fallen because of the economic slowdown and the decline in inflation, it’s worth noting the effect of global bonds. The chart shows the total negative yielding global bonds started increasing in October. The 10 year yield topped in November. This chart partially explains the recent negative correlation between the 10 year yield and U.S. stocks. Anytime real wages are growing faster than 1%, it’s great news. We’ve seen some commentators on Twitter unimpressed by real wage growth in the low single digits, but it’s worth noting how real wage growth was usually negative when inflation was high in the 1970s and 1980s. 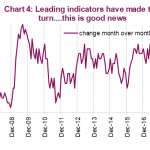 Positive real wage growth is always good, especially with the economy is near full employment; a large swath of workers are experiencing the gains. 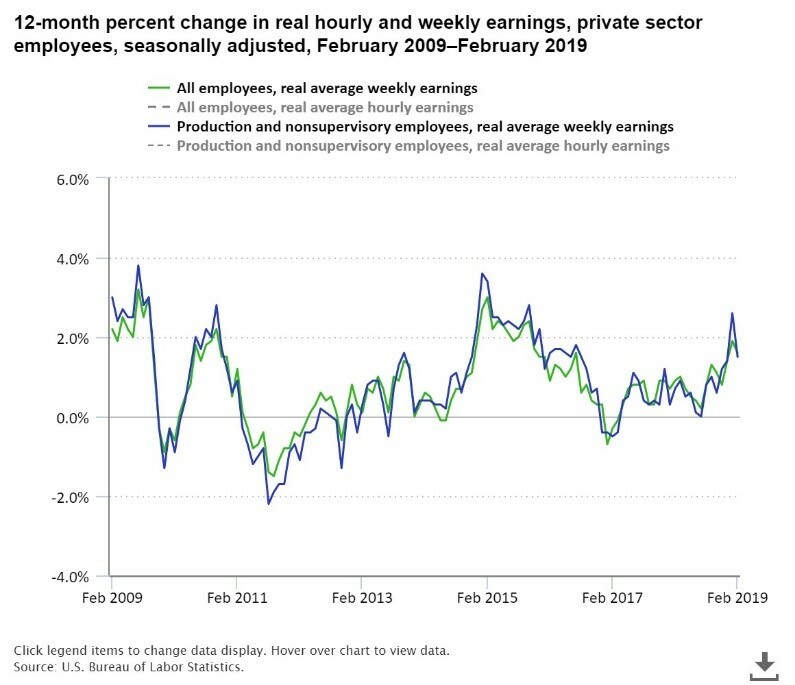 In February, average hourly real wage growth increased from 1.6% to 1.9%. Non-supervisory average hourly real wage growth increased from 2% to 2.2%. As you can see from the chart below, real weekly wage growth fell from 1.9% to 1.6%. Average real weekly wage growth for production workers fell from 2.6% to 1.5%. It went from way above the other readings to in line with them. If the work week increases in March, weekly wage growth should increase near January’s rate. In February, the Cass Freight shipments index was down 2.1% partially because of tough comparisons. The 2 year stacked growth rate was 9.1%. Growth was also weak because infrastructure in many industries and modes of transportation are at or near capacity. Plus, the labor market is so tight that it’s tough to grow the active workforce. As the chart below shows, expenditures were up 5.5% yearly and 20.6% stacked 2 years. If you are skeptical of the Cass Freight index, know that there has never been an economic contraction without there first being a contraction in freight flows. Fund managers aren’t optimistic about equities, but a growing percentage expect a stronger economy. Fund managers coming back into the markets will be great for stocks. Treasuries are rallying partially because global yields are falling. Real wage growth remained solid in February. The work week needs to increase to boost weekly real wage growth in March. 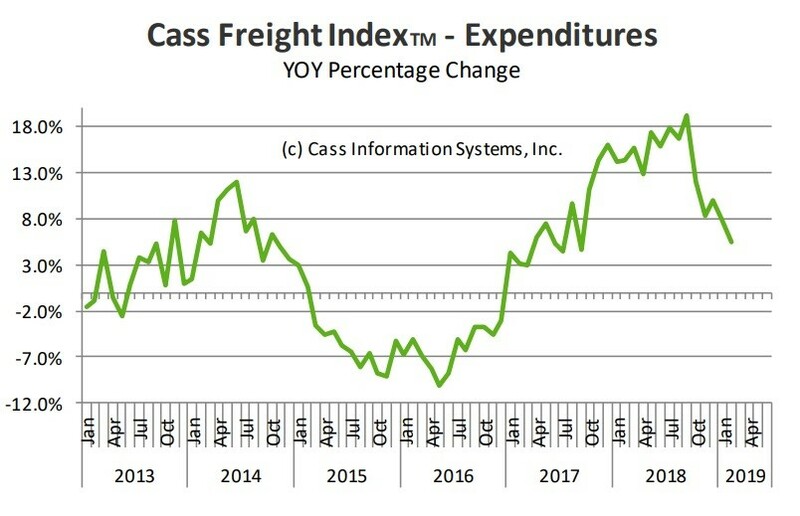 The Cass Freight shipments index is falling, but at least the 2 year growth stack is 9.1%. 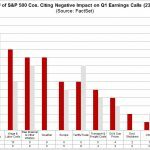 FedEx reported terrible results, signaling global trade growth is very weak.